Seventy miles offshore in the middle of the Gulf of Alaska, at the edge of the continental shelf, sits Middleton Island. Middleton is home to the abandoned Middleton Island Air Force Station, a few summer seabird researchers and thousands of birds. In the bird research world, the island is best known for the Black-legged Kittiwakes that breed there. USGS and university researchers have been studying the kittiwakes during their breeding season on Middleton for over 20 years. 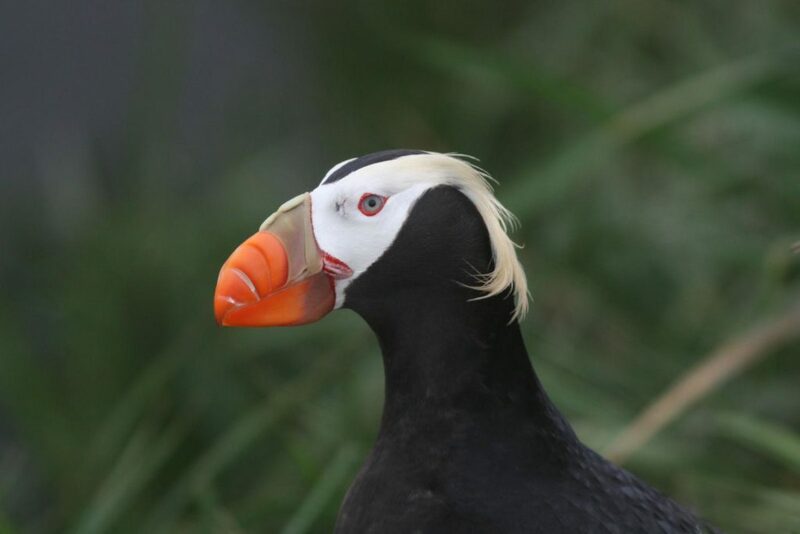 Recent attention has been drawn to another seabird species that breed on Middleton—the charismatic Tufted Puffin. 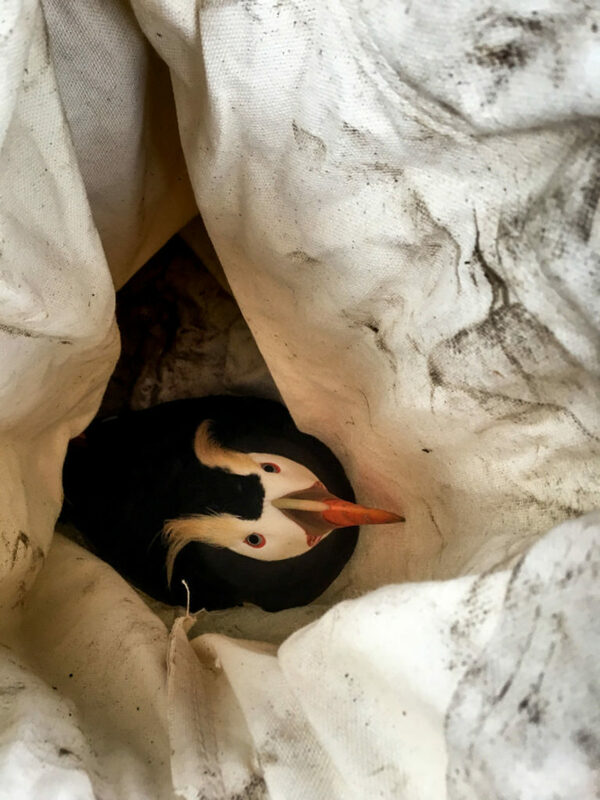 These puffins are the focus of a new study by Prince William Sound Science Center (PWSSC) avian ecologists Kristen Gorman, Mary Anne Bishop, and Anne Schaefer thanks to funding from the North Pacific Research Board. Thousands of Tufted Puffins nest on Middleton Island, making this an ideal study area for researchers. Photo by Anne Schaefer. 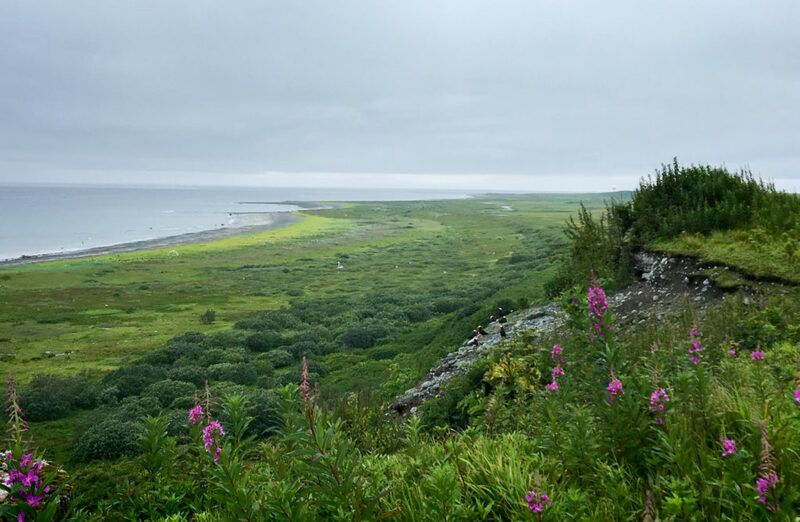 Middleton Island’s Tufted Puffin population attracted PWSSC researchers after a new study suggested the previously robust Gulf of Alaska populations may be in decline. With thousands of nesting puffins and relatively accessible burrows, Middleton Island provided the perfect base camp from which to study these birds. Most scientific knowledge about Tufted Puffins is focused on breeding. All seabirds come to land to lay their eggs and rear their chicks, but most seabirds spend at least 7-8 months completely at sea during the non-breeding season. Little is known about puffin ecology after they leave Middleton Island and other breeding colonies in the Gulf of Alaska. The PWSSC study is unique in this respect; “We’re trying to understand what is going on with these birds during the time of the year when it is hard to study them,” says Kristen. So, how do you collect information about a bird’s ecology over the long dark winter months that it spends in (probably) the middle of the ocean with almost no humans around to make observations? Mary Anne, Kristen, and Anne are using geolocator tags and stable isotope analysis to find out where puffins are going and what they are eating during these winter months. 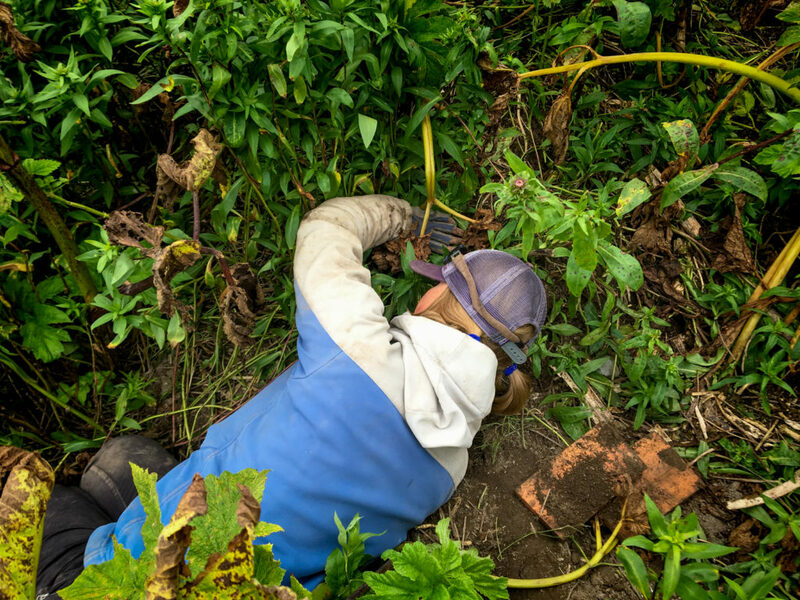 Kristen reaching into a Tufted Puffin burrow on Middleton Island in search of an adult puffin for sampling. Photo by Anne Schaefer. The geolocator tags, a relatively new technology, are notable for their small size. Researchers are able to temporarily attach these electronic devices to the leg of a puffin using a plastic band. They measure daily light levels, which correspond to latitude and longitude. The data are stored in the tag’s electronics, which will be collected when the puffins return to Middleton Island the following breeding season. 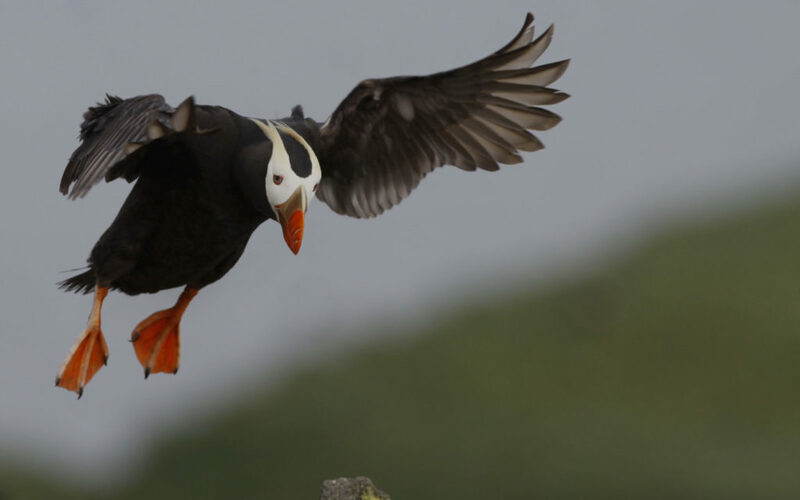 When it comes to what they are eating, PWSSC researchers have a specific question that they hope to answer: Is there a trophic shift (change in the relative position in the puffin food chain) between winter and summer? 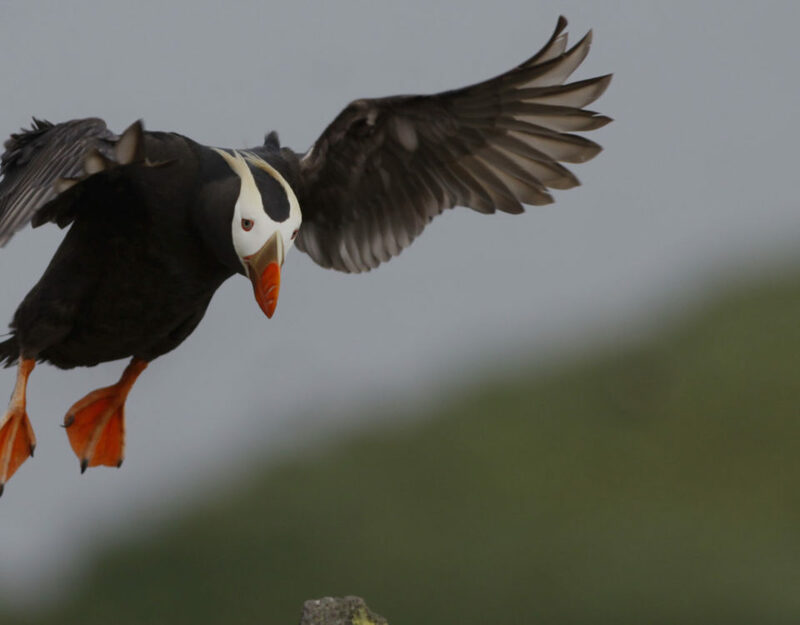 We know puffins feed on little forage fish in the summer, but there is some suggestion that they may be feeding more on zooplankton in the winter. If this is the case, analysis of tissue samples the researchers are collecting will show the summer isotope values (based on blood tissue) to be larger in comparison to winter isotope values (based on feather tissue). The great thing about analyzing stable isotopes is that different tissues have stable isotope values that reflect different time periods. Kristen provided an example referring to the white face patches on puffins. 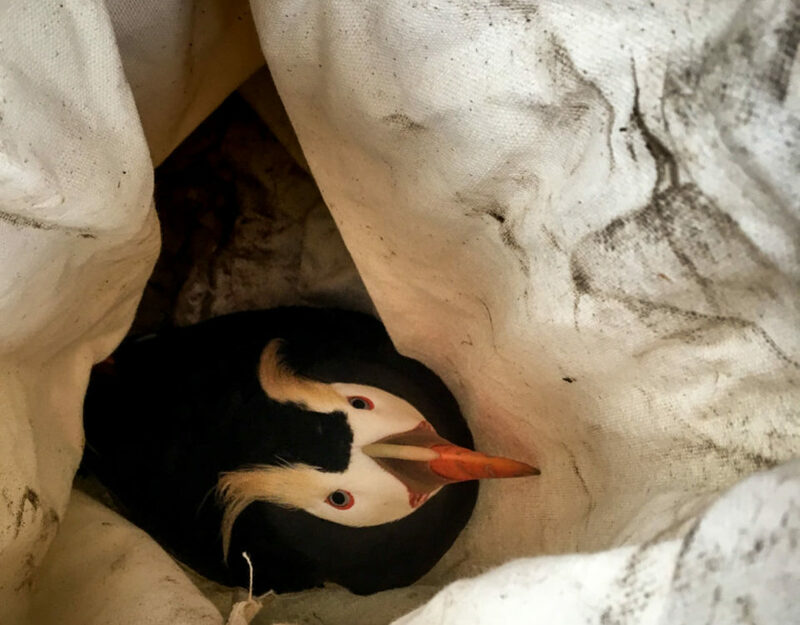 “The face patches turn white during the late winter/early spring as they get ready for the breeding season.” If you see puffins in the winter, they are a drab dark gray color. “If we sample those [white face] feathers, we know roughly when that tissue was built.” The blood tissue that the researchers sample have a much higher metabolic turnover rate. “When we take blood, we get red blood cells and plasma. The red blood cells reflect an individual’s diet within the past month to six weeks [before the sample was taken]. The plasma has an even shorter time period than red blood cells.” By sampling both feather and blood tissues researchers can collect feeding data from different time periods such as early winter and summer. Photo caption: The white face feathers on this puffin can be analyzed for stable isotopes to determine an individual bird’s late winter/early spring diet. Photo by Chris Barger. We thank Dr. Scott Hatch and the Institute for Seabird Research & Conservation for logistical support, particularly in allowing us to use their base camp while conducting fieldwork at Middleton.